I love adding more and more minimalist running shoes to my arsenal! 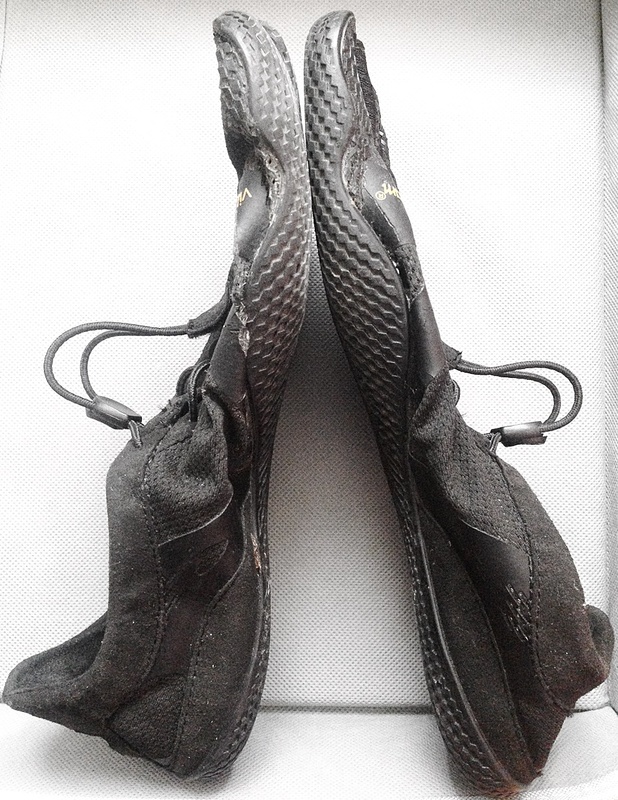 My preferred, go-to minimalist running shoe, when I’m not running barefoot, are the Vibram Five Fingers, mainly because the overall structure of their shoes compliments the anatomy of the foot and provides the foot greater opportunity to self-strengthen, an opportunity that we do not have in regular traditional running shoes. This is one of the Vibram Five Fingers greatest strengths! I particularly enjoy running in the Vibram Five Fingers KSO EVO, which are one of Vibram’s thinner, softer, lighter running shoes and are made for both road and trail running. They provide warmth for running in cooler weather AND Vibram has improved the inner-lining material conditions, so that the inside of the KSO EVO feels much softer on your foot! In the KSO EVOs, the toes take a more proactive role in securing a more stable, steady, strong footfall during forefoot running, which will have big payoffs in avoiding ankle injury.. I also love that the KSO EVO is great for running in the rain as their unique zig-zag tread pattern provides excellent grip on wet, slippery surfaces. 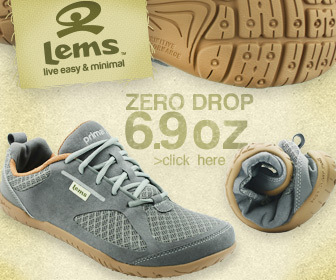 They can definitely be considered a water shoe alongside being a supreme, lightweight running shoe! 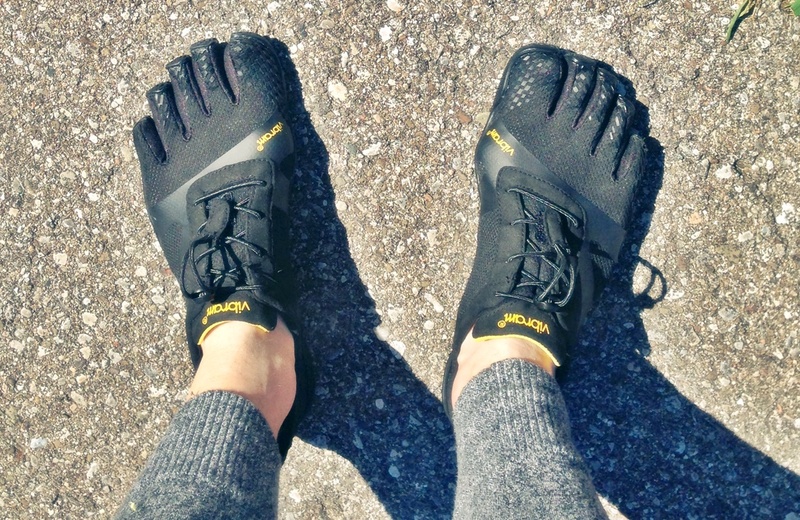 So, without further ado, here’s the rest of my Vibram Five Fingers KSO EVO review and how they contrast to other miminalist running shoes, including other Vibram models! 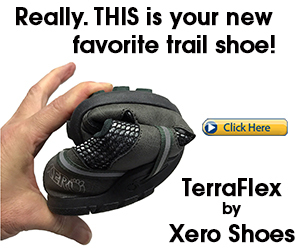 In general, there’s a reason the Vibram Five Fingers are gaining more influence. For one, they play a defining role in keeping the toes strong, flexed and engaged at each step, which is going to safeguard against balance instabilities. Most of us have had our feet locked in the traditional running shoe — shoes that have a stiff, narrow toe-box, causing the toes to be under-engaged, weak and unable to spread out and flex as they normally should! When the toes are weak, this does not sustain well for balance control during running! 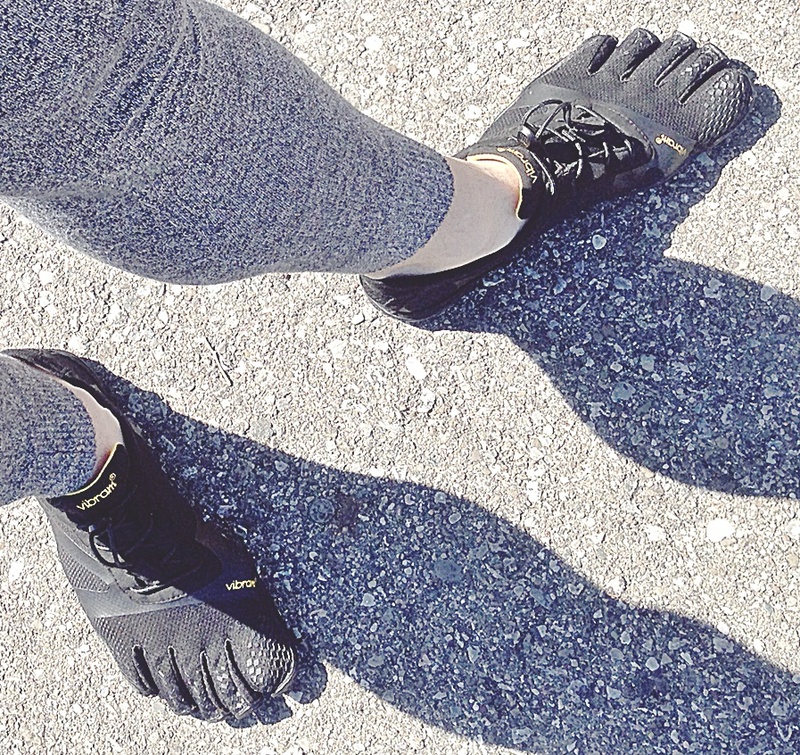 This is why the Vibram Five Fingers should top your agenda because they encourage the full involvement of toe splaying, flexion and extension which will recharge foot strength and reshape the foot in positive ways narrow traditional running shoes can never do! In regards to the KSO EVO, the upper is non-restrictive, but fluid, stretchy and flexible, working with your foot, not against it, enabling your toes to be over-engaged in the way that they should in stabilizing your footsteps, bringing together better balance control. Just as equally important, when it comes to maintaining good forefoot running form, proprioception matters! That is, you have to remember, the bottoms of the bare feet are studded with sensory and pressure nerves that have a strong involvement in managing mechanical effectiveness. Your feet need to sense the ground to help pull together the mechanics that produce lighter footsteps and prevent high impacts from creeping up! These nerves also directly influence muscle and soft tissue tone in the foot! This is why our feet are very sensory-seeking AND in order for our feet to thrive in strength and function, the sensory nerves need to be continuously stimulated and firing. This is what makes the KSO EVO a fantastic forefoot running shoe because its super thin outsole taps the sensory input that your feet crave for sustained vitality! It’s becoming increasingly evident in the scientific literature that sensory input at the feet is going to have an influence on helping you make the best changes to your running form –changes such as landing with a forefoot strike. What makes the KSO EVO’s so effective is that they give you the sensory access you need to enable you to put into action the mechanics that foster low impact exchanges. Aside from running barefoot, the KSO EVO finishes the job in helping you get a properly aligned forefoot strike, preventing harmful impacts from creeping up. In the minimalist/barefoot running world, the Vibram Five Fingers usually gets the most attention because of their signature toe pockets, but also for their incredibly thin outsole of which sensory input contributes more fully in helping your forefoot strike be engaged in the way that it should. I’ve had the KSO EVOs for a couple years now. I run 18km-21km daily in them, on grass, dirt/dusty trails and pavement, mostly in the spring, summer and fall. Structurally, they’ve held up pretty well, but you can tell that there’s been a lot of miles tacked on them! Nonetheless, I will continue to wear them because Ive had nothing but success and good quality miles in them. Excellent for running on roads, grass, the beach and other softer surfaces; excellent for high agility movements, perfect for water sports, such as kayaking and kite-boarding, very durable for gym workouts, great for long hikes, perfect for everyday use! Excellent breathability for summer running, yet somehow, provides warmth for cooler temps! Allows you to tread safely on slippery surfaces because the XS Trek compound, zig-zag patterned outsole provides prime traction with lots of flexibility in all directions; handles well on wet, rocky surfaces, too! The zig-zag tread pattern on the kso evo provides excellent grip and traction on wet surfaces, but provides enough rubber-material protection from rocks. I love how the flexible, stretchy, movement-accommodating upper of the KSO EVOs deepens and intensifies foot muscle engagement, promoting a wider range of muscle activity that fosters a stronger, more resilient foot. As compared with the Vibram KSO Classics, the KSO EVO has more overall padding and softer underfoot protection, but still retains high degree of proprioceptive input (sensory feedback); the toe sockets and the rubber outsole of the KSO EVO are more flexible and soft than the KSO Classics; the KSO EVOs are also more stylistic, lower profile and sleek than the KSO Classics; provides better traction than the Vibram KSO Classics AND the outsole of the KSO EVO doesn’t come up the side of your foot like the KSO Classics, giving the KSO EVOs a more natural, barely-there feel, like you’re wearing a sock rather than a shoe! I must underscore that because of their glove-like fit, the KSO EVO fit small and snug, but not tight, so be sure to order one size up from your regular size. 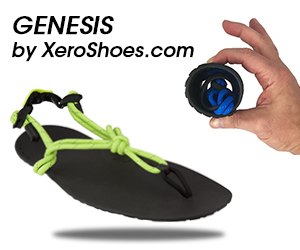 Here are other barefoot running shoes to add to your glorious forefoot running shoe collection! You can also check out my YouTube video: here, where I provide a more in-depth assessment on the functionality of the Vibram Five Fingers KSO EVO and how the shoe fits in on preventing structural weakness of the foot and how they play an integral role in improving the quality of your running form. On my channel, you will also learn more about the health and performance benefits of barefoot running and minimalist running as well as nutritional info to help you grow your endurance and enrich your post run recovery! Injury-proof your legs and feet with barefoot running. Do you stretch before you run? Studies suggest you may want to warm up instead. Why running without shoes feels strange at first. Give yourself more energy before a morning run with these water-soluble energy tablets. What is forefoot running and how can it protect you from injury? First, thank you for all the effort you put in this blog. As someone who’s considering to step in the minimalist shoes world, it’s given some useful piece of advice on the subject, which i really needed. Now, i was wondering, between this model (KSO evo) and the sokwa X8, which one would you rather have, personally, as a long time runner ? In terms of durability, confort… I can’t make my choice between the two. ps : Sorry if any mistake snuck in my comment. I’m not a native speaker, so it happens.